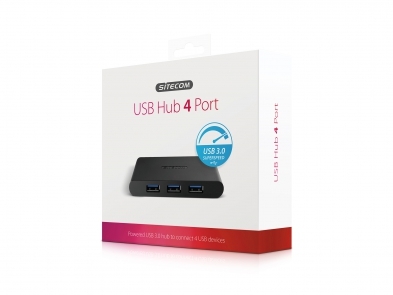 The CN-083 USB 3.0 Hub 4 Port from Sitecom lets you add extra USB 3.0 ports to your MacBook, Chromebook, Ultrabook or regular notebook to connect all your USB devices. Supplied with an external power adapter, this USB hub can support any USB device, also ones with a higher power consumption such as external hard drives, phones, tablets and digital cameras. Connect up to four USB devices simultaneously and never run out of USB ports again. The CN-083 USB 3.0 Hub 4 Port supports SuperSpeed USB 3.0 transfer rates of up 5 Gbps per port and lets you transfer and copy files 10 times faster than with Hi-Speed USB 2.0, ideal for transferring large files such as HD movies. 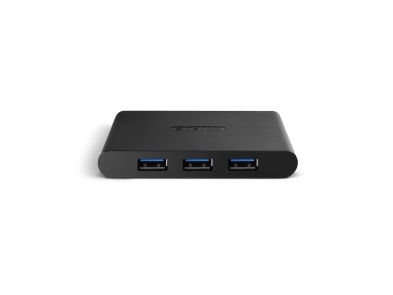 The CN-083 USB 3.0 Hub 4 Port is backward compatible with USB 2.0 and USB 1.1 and is fully Plug & Play out of the box. Simply connect the hub with the included 100 cm USB 3.0 cable to a free USB 3.0 port of your MacBook, Chromebook, Ultrabook or regular notebook, no drivers needed. The hub is compatible with all operating systems.